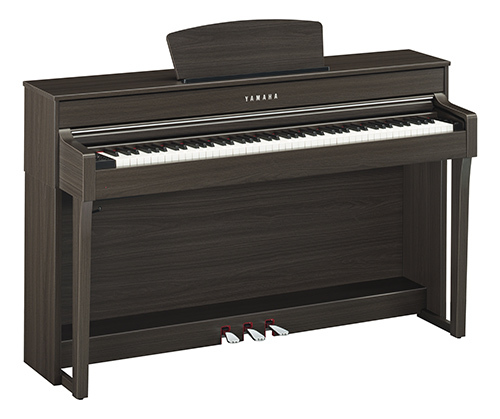 The Yamaha Clavinova CLP-635 wraps an authentic piano playing experience into a decor-friendly traditional package. A Graded Hammer GH3X keybed, synthetic ivory/ebony keytops, and escapement ensure that you'll delight to the touch of this superb digital piano. The piano voices are sourced from premium, hand-selected Yamaha CFX and Bösendorfer Imperial concert grands. Listen to the CLP-635's binaurally sampled Yamaha CFX through headphones, or feel the full-bodied resonance of Virtual Resonance Modeling through the onboard stereo speaker system. Either way, the CLP-635 delivers realistic grand piano sound at any volume. There's even an onboard 16-track recorder to capture your inspiration. Grace your home with the superb Yamaha Clavinova CLP-635!